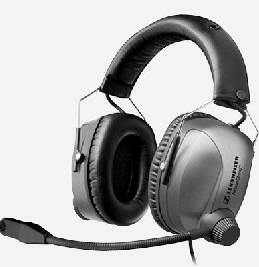 March 28, 2010 – Aviation headset manufacturer Sennheiser was formally recognized by the Florida Wing of Civil Air Patrol (FL CAP) earlier this month for donating a range of aviation headsets valued at approximately $20,000. The headsets, which will be put into rotation by FL CAP's flight familiarization program, will be used by more than 1,800 cadets pursuing careers in aviation and distributed to Civil Air Patrol squadrons throughout Florida. With more than 3,800 members, the Florida Wing is the largest CAP wing and the third most active. During the last year, the Wing has seen its cadet count increase by more than 10 percent to roughly 1,860. The new headsets play an important role in equipping FL CAP's student outreach program. In addition to the cadet program, Civil Air Patrol's missions include emergency services and aviation education. Since 1941, volunteer airmen of CAP -- the U.S. Air Force's volunteer, civilian auxiliary -- have performed search-and-rescue, civil defense and homeland security tasks. Col. Chris Moersch, the Florida Wing commander, commented: "I certainly want to thank Sennheiser for their support of our Cadet Orientation Program. Their contribution not only significantly contributes to our program, it also demonstrates their commitment to both general aviation and our nation's youth." Lt. Col. Arnie Glauser, who coordinated the Sennheiser presentation, added: "We met Sennheiser's David Dunlap at the annual SUN 'n FUN Fly-In in Lakeland, Fla., last year. We discussed the CAP and our student outreach program, and I told him how we continually encourage cadets to consider a career in aviation. I also mentioned that we are often unable to provide each cadet with his or her own headset during flight. Sennheiser rose to the occasion and generously donated equipment to help cover this need." David Dunlap, Sennheiser Aviation, commented: "It is an honor to be associated with and recognized by the FL CAP. By making a donation such as this, we are able to express both our support for the FL CAP and the critical role it plays, as well as our passion and expertise in aviation headset technology. We hope to see many more cadets enroll in programs such as this." Sennheiser donated a range of headset models including the HMEC 356, HMDC 372, HME 105 and HMEC 355-C. Each of these headsets deliver outstanding audio quality and many feature Sennheiser's NoiseGard™ active noise reduction, which dramatically reduces extraneous noise while providing an added degree of hearing protection. Sennheiser is one of the world-leading manufacturers of aviation headsets, microphones, headphones and wireless transmission systems. With their top-quality acoustics, high wearing comfort and rugged designs, Sennheiser aviation headsets are suited to the needs of professional and private pilots and air-traffic controllers. Innovations such as the NoiseGard active noise compensation system and ActiveGard protect against potentially harmful volume surges. Civil Air Patrol, the U.S. Air Force's only auxiliary, is a nonprofit organization with 57,000 members, 3,800 of whom are in Florida. CAP performs 90 percent of continental inland search and rescue missions as tasked by the Air Force Rescue Coordination Center. CAP was credited by the AFRCC with saving 90 lives in fiscal year 2008. Its volunteers also perform homeland security, disaster relief and counterdrug missions at the request of federal, state and local agencies. CAP members play a leading role in aerospace education and serve as mentors to more than 22,000 young people participating in CAP cadet programs.